I have a new find..... and I think I'm in love and hope that Sara will be tooo. So, Sara and I have been stuck inside a lot this week. Tuesday I was sick and then Friday she started getting sick. I think she's on the mend now; hopefully; but to be sure she and I stayed home from church today. Sara loves watching Nick Jr. and as a treat she gets to watch some and so we were curled up in bed this morning and a show that I hadn't seen came on. 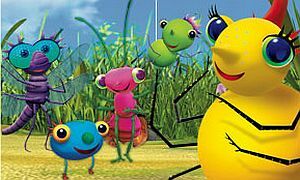 It is called Miss Spider's Sunny Patch Friends, do you know the show? I am in love with it now. The mom (Miss Spider) is an adoptive mom! Today's episode was about her son the dragon fly who she had adopted meeting some other dragon flies and wanted to explore life as a dragon fly. Even though he loved his mom and dad (who were spiders), he wanted to learn about his own kind of bug (culture). His parents supportively loved him through his exploration and reassured him with their love. The dragonfly was shown talking with his brothers and sisters (who were all different kinds of bugs), telling them off his love for his adoptive family and that of his own kind (culture and dragonflies). Hi Everyone! I want to share about another friend whose soap business is supporting adoption. Cheryl, also lived down the hall from me at UNC-Greensboro. She, her husband, and daughters are currently waiting to be matched for a domestic adoption. They are actually one of the Christian Adoption Services waiting families (it's a small world- I haven't seen Cheryl and Ted in almost 15 years and now I see them a couple times a year at CAS functions). Please check out Cheryl's soaps at Bright Star Soaps: http://www.etsy.com/shop/brightstarsoaps and help them with their adoption. I want to share with you all about a great gift idea for Christmas. A dormmate of mine from UNC-Greensboro has a homemade soap and lotion company that you should check out at http://www.catiebeth.com/. Catherine and her family adopted a little boy from Ethiopia earlier this year and now she is donating her profits to other families that God has lead to adopt. It's National Adoption Month- Christian Adoption Services Needs your Help. Most of you don't know but Sheryl (another Counselor) and I spent 3 days in Wilmington last week networking at the annual conference for health departments in NC. Well Sheryl did the networking and I assisted (total honesty should be good!). We made MANY great contacts throughout the state and most people were eager to get their hands on our information to pass out to their pregnant clients. We were asked several times for packets in Spanish and not just English to be able to present the option of adoption to Spanish women/men. We are seeking a volunteer who would be able to translate 5 pieces of papers into Spanish which would help explore adoption as an option. As in years past we headed over to my parent's neighborhood for a little Halloween fun. Each year my mom makes chili in the crockpot so that whenever your hungry you can stop by the house for a little food. This year was extra special since the Barclays have moved back to Charlotte, Sara had her best friends and cousin, Ella a.k.a. Super Ella along to run the streets with. The boys were off on their own in the neighborhood with friends. (We didn't even get a picture of them, which goes to say they are getting to Big too fast). Sara a.k.a. the Butterfly, fluttered her way throughout the neighborhood and enjoyed having her pumpkin filled. While Super Ella soared right next to her.! Olivia, a.k.a. the pumpkin, joined in the festivities at the tail end. Getting prepared to fly and soar away! David, Jared, Xander, and my mom took off after church today to head to the Concord Regional Airport. There was a B-17 Bomber on display that they could tour (for free), or ride in (for $400.00 a person). The boys were very excited and David being a history buff was in his glory! Mom enjoyed herself too. They all talked about how tiny the inside of the plane was. From the pictures, it looks like they all enjoyed themselves. The Anne Springs Close Greenway near our house held a Fall Festival this year. Well the festival consisted of horse rides, a corn maze, a bail of hay maze (for the the younger kids), a wagon ride throughout the Greenway, and corn hole. They also had a few pumpkins to purchase and some goodies. Since it was a nice fall day; and all the family is now in Charlotte we headed out to enjoy some fun family entertainment. We also had Garrett for the night; so in total we had six kids. [For those of my friends that have more three children (like I do) I have a whole new respect for you]. Sara has a new love; Horse back riding (David is looking into riding lessons; I'm not so excited-especially since I'm allergic). Ella, Garrett, and Xander enjoyed it too. Jared was off running around, and Olivia enjoyed the festival from the comforts of her stroller nestled in a cozy blanket. I am a wife to a great man and a mom of three amazing kids; Jared-13 yrs old, Xander- 10 yrs old, and Sara who is two years old. I am a social worker for an adoption agency and for a home health agency. URGENT- Baby Boy Needs Family By FRIDAY!! When God Gives You EXACTLY What You've Prayed For!